I’ve lived in NJ almost all of my life, and yet have never been down to Cape May before. So when I found myself in that area this past week, I thought I would take the opportunity to get my wing on. The only question: Where to go? My navigation showed me a couple of places to grab wings, but according to numerous locals that I talked to, I only needed to go to one… The C-View Inn. I stopped into this quaint little place tucked away by the marina that reminded me of a classic home town bar. Everyone knew everyone and the bartender, Dan, made sure they were all taken care of with a quick and friendly attitude. It’s no surprise seeing how they were voted “Most likely place to meet a local” from CapeMay.com. 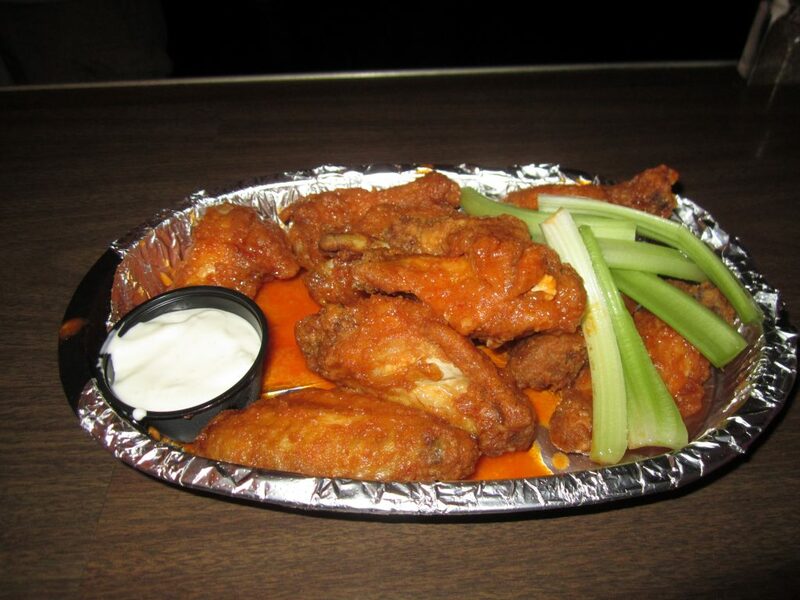 But again, I came to give their “famous” wings a whirl… and whirl away I did. I got the 10 count with the “Hot” sauce and sipped my beer while I waited for them to arrive. I opted to get the celery and blue cheese for an additional $.50 to see how they came out, but was a little disappointed because I feel that they should be included. But then I’m left thinking that the overall price would be increased by $.50 and what if I didn’t want the celery and all. So it’s really 6 of one and half a dozen of the other… and why am I still on this, let’s talk about the wings. The wings came out on an aluminum foil lined basket all nice, hot and covered with sauce. They were extremely breaded, more so than I’m used to, and had a great crisp. Each bite of the wing portion fell off into my mouth without tearing the rest of the wing apart; it was so tender. But I noticed that the drum sections were a little more chewy and weren’t as good. Also, the downfall to having that much breading is that it soaks up the sauce so quickly which left me requesting more for the remainder… and I definitely wanted more because the sauce had such a unique flavor and was clearly the star of the dish. I could taste the peppers, but they were cut with some other ingredients that made them awesomely candy-like while still offering a bit of bite. It was so good that I couldn’t eat the wings fast enough, and I began to understand why the C-View is a popular joint amongst local wing eaters. Overall The C-View Inn was a warm, friendly corner bar that offered up great wings with great service. The buffalo wings were hot, tasty, kept me coming back for more, and ultimately satisfied my craving for the evening. So if you find yourself in Cape May (like I did finally), I would recommend stopping in as well. Extra bonus… try to do it on a Wednesday when it’s wing night and only pay $.39 a wing.